If given the chance, not many people might choose to work on their 95th birthday — but National Park Service Ranger Betty Soskin sees her work as an opportunity to share her wisdom. 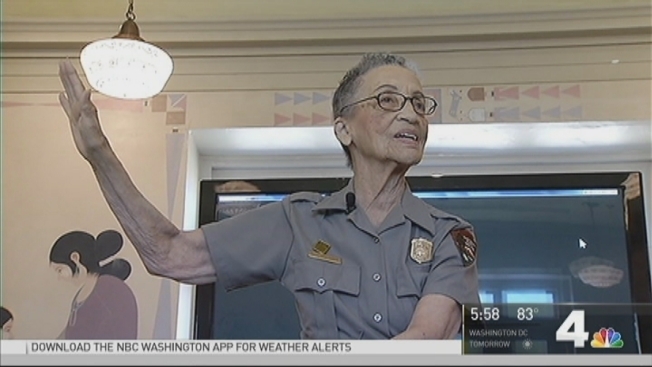 Soskin, the oldest park ranger for the country, is in Washington, D.C., to help celebrate the opening of the National Museum of African American History and Culture. "I know how my generation met the threat of its day," Soskin told a group of local students on Thursday. Soskin met with the local students to share her experience growing up during World War II and what is was like for women and minorities like herself during the civil rights era. "We have no nostalgia for that period. That is a painful period of rejection," Soskin told News4. Sharing her story is Soskin's full-time job back in her home state of California, where she works at the Rosie the Riveter/WWII Home Front National Historical Park in Richmond. She didn't become a park ranger until she was 85 years old. Soskin said touring the new African American museum brought memories of the days during her childhood when she traveled with relatives from California to Louisiana. "When we got to El Paso, Texas, we would have to go into the Jim Crow car," Soskin said. Recently, she made national headlines after someone broke into her home and brutally attacked her, stealing the presidential coin she received after lighting the national Christmas tree last December. In July, Secretary of the Interior Sally Jewell gave Soskin a replacement coin during a surprise ceremony. Jewell asked Soskin to go with her to the grand opening of the African American museum on Saturday. As Soskin says in her blog, "this 'lil ole lady ranger will be rubbing shoulders with the likes of Laura Bush, Oprah Winfrey, Quincy Jones, Willie Brown, General Colin Powell, etc., and we may all be wondering just how on earth she ever got on the A-List!"